These wooden table top plinth menu holders have a rustic antique pine stain finish and feature a 3mm groove down the centre to place menus and other promotional info for your customers. Ideals for bars, restaurants and other retail outlets to display special offers, menu items, specials, etc. 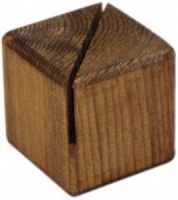 Made from solid timber with an attractive pine finish. Please Note: where table numbers are selected a brushed gold effect number disc will be screwed to each side on the menu holders. A sequence of numbers from 1 up to the number of menu holders ordered will be assumed but if you wish to have a different set of numbers please email us quoting your order number to advise of your preferred choice. 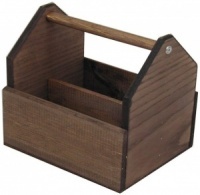 Wholesale and bulk buy discounts may be available on these menu holders subject to your required quantity. Please call us to enquire.